This is a sample of the briefing we sent to our clients on Tuesday, January 29th, 2019 about the impending “polar vortex” cold outbreak. Dangerously cold air is starting to filter into the Northern Plains and upper Midwest this morning, with wind chill values colder than -50F in parts of northern Minnesota and eastern North Dakota. Cold air is expected across the region through the middle of the week, with the coldest day for many areas expected to be Wednesday. That is when areas from Minnesota to Chicago may not make it out of the teens below zero for highs. Wind chill values will be even colder, with some areas of the upper Midwest expected to see wind chills as cold as -60F Wednesday morning. Dangerously Cold Air Filtering Into The Northern U.S. Already this morning cold air is filtering into parts of the northern United States, with some reported wind chill values of at least -50F in northern Minnesota and eastern North Dakota. Highs And Lows Through Thursday. Bitterly cold air will continue to filter south and east over the next couple of days, with temperatures dropping across parts of the upper Midwest today. Wednesday is still expected to be the coldest day of the outbreak in most areas of the upper Midwest, with highs not expected to get out of the teens below zero for locations like the Twin Cities and Chicago. In several locations, record lows and record cold highs are expected to be broken. Wind Chill Values. Dangerous and life-threatening wind chill values will also occur with this stretch of bitterly cold weather. The worst morning in the upper Midwest will be Wednesday, as wind speeds along with the cold temperatures will make it feel as cold as -60F in spots. Wind chill values won’t improve too much during the day Wednesday, with another bitterly cold start expected Thursday. These wind chills would cause frostbite in less than 5-10 minutes. Bismarck, ND: Wind Chill Warning through Noon Thursday for wind chills as low as -45F. Fargo & Grand Forks, ND: Wind Chill Warning through Noon Thursday for wind chills as low as -65F. Pierre, SD: Wind Chill Warning through Noon Thursday for wind chills as low as -45F. Sioux Falls, SD: Wind Chill Advisory through 3 PM today, a Wind Chill Warning from 3 PM Tuesday to Noon Wednesday, and a Wind Chill Advisory from Noon Wednesday to 9 AM Thursday. Wind chills as low as -40F to -55F during the warning period, with wind chills as low as -25F to -35F during the advisory periods. Minneapolis, MN: Wind Chill Advisory through Noon Tuesday with a Wind Chill Warning from Noon Tuesday to 9 AM Thursday. Wind chill values are expected to be as low as -35F today and as low as -55F during the warning period. Des Moines, IA: Wind Chill Advisory through 6 PM Tuesday with a Wind Chill Warning from 6 PM Tuesday to 9 AM Thursday for wind chill values as low as -45F to -50F. Omaha, NE: Wind Chill Warning from 6 PM Tuesday to Noon Wednesday with a Wind Chill Advisory from Noon Wednesday to 9 AM Thursday for wind chill values between -20F and -40F. Kansas City, MO: Wind Chill Advisory from 6 PM Tuesday to Noon Wednesday for wind chills as low as -25F. 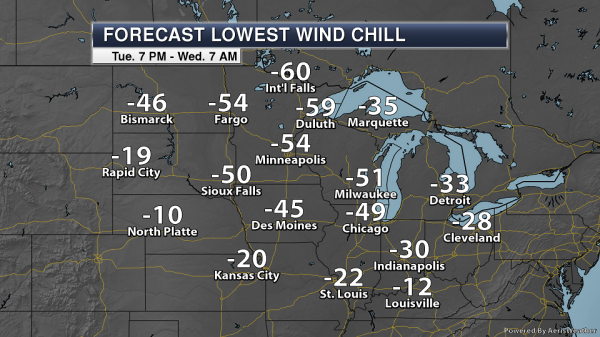 St. Louis, MO: Wind Chill Advisory from 6 PM Tuesday to 1 PM Wednesday for wind chills as low as -25F. Milwaukee, WI: Wind Chill Advisory until 6 PM Tuesday with a Wind Chill Warning from 6 PM Tuesday to Noon Thursday for wind chills of -20F to -34F today and as low as -55F during the warning period. Chicago, IL: Wind Chill Advisory until 6 PM Tuesday with a Wind Chill Warning from 6 PM Tuesday to Noon Thursday for wind chills as low as -20F to -30F today and as low as -50F to -55F during the warning period. Indianapolis, IN: Wind Chill Warning from 10 PM Tuesday to 1 PM Thursday for wind chills as low as -40F. Louisville, KY: Wind Chill Advisory Wednesday from 5 AM to 2 PM for wind chills as low as -15F. Cincinnati, OH: Wind Chill Warning Wednesday from 4 AM to 7 PM with a Wind Chill Advisory from 7 AM Wednesday to 1 PM Thursday for wind chills as low as -30F. Detroit, MI: Wind Chill Warning from 6 PM Tuesday to 11 AM Wednesday for wind chills as low as -40F. Cleveland, OH: Wind Chill Warning from 1 AM Wednesday to 4 PM for wind chills as low as -30F. Pittsburgh, PA: Wind Chill Advisory from 5 AM Wednesday to 5 PM Thursday for wind chills as low as -20F. Buffalo, NY: Wind Chill Watch from Wednesday morning through Thursday afternoon for wind chills as low as -25F.